So enough of the raves about other people's Halloween goodies - its time to reveal our own Halloween invitations for this year's party. We had already done traditional (2008's xray inspired invitation and an infestation theme), spooky (2009's creature survival kit invite, climbing skeleton decorations, and ghoulish soiree), twisted (2010s freakshow invitations, decor and party), gruesome (2011's insane asylum invitations, decor and party) and whimsical (2012's Wizard of Oz invite, decor and party) - it was time to do kitschy. And what is more kitschy than the worst horror movie made in recent history? SHARKNADO! Not your traditional Halloween concept but you know I like to keep our friends guessing! I'm almost done decorating the front of the house and I'll be sharing that next week. As for the party, I don't have a thing done yet. Anyone have any sharknado themed menu suggestions? Love this year's invites, they are great! As far as food, I say Sushi. That way you and your guests can bite back at Sharknado! You have totally inspired me to step outside the box on Halloween invites. We just sent our's out this weekend, so hopefully I will have a post up this week. Thanks for the inspiration and the always wonderful Halloween posts! Oh my goodness! Those invitations are delightful Jennifer!  I wondered if there were any more blogs out there like Brooklyn Limestone! I hope you have lots more awesome posts! I didn't see this one coming! It was such a bad movie! I love that you did this! Will the house be shark infested too?? Oh that's fantastic! You always have THE BEST ideas! I made one in the summer (testing out my skills for this party) but I think we missed watermelon season. Happy to see the shark watermelon made it to the party after all! Blue Corn Chips, look like shark fins. maybe a blue dip. Your party invites are truly awesome, always. I would love to get one of these in my mailbox. Can't wait to see more of your Halloween posts. hahahahaha.........I've never been huge about halloween but get a kick out of your shenanigans. Bush Gardens and Universal Studios (here in Fl) would be a delight for you. I'll volunteer to Aggiesit :-). Thanks. Ive been to the Universal Halloween Horror Nights a few times and its crazy scary. I was really impressed. Maybe put together a good tomato based seafood stew or chowder - serve it in a big white bucket with some fake blood splatters on the outside and label it Chum. Seaweed salad, serve your finger foods on a bed of sea salt. Severed limb red velvet cake. Love your party themes! Blue jelly in a cup with a mini shark inside? I can't remember if they did this in Sharknado because, well, I was a little too busy laughing to pay attention, but you could package some little assorted snacks together like you've raided a vending machine. Bonus points if you made a fake vending machine out of cardboard and just had them spilling out. I also remember there being some kind of bar with a terrible name, maybe you could do some fake shark-themed cocktails (or mocktails), and make some little cocktail napkins or coasters with "Fin" on them? You could also make cookies in the shape of surfboards with little bite marks taken out? WOW, this year is a creative departure of a typical Halloween. Refreshing theme. Not sure if I have any suggestions but years ago at Reading Terminal buying fish one of the fish stands suggested Shark steaks... I don't eat meat. I still can hear his words "tastes like pork"! and with everyone picking up the appetizer I said " tastes like pork"! Enjoy your Halloween party this year, Mrs. Limestone you rock! Since I shy away from creepy and gruesome Halloween decorations, this one is my favorite of all your amazing themes! Very creative. Another home run, Mrs. Limestone! Haha LOVE IT. So great! Can't wait to show my husband. Can't wait to see the party! Every year you out-do yourself! These invitations are awesome and I'm sure your friends will get a big kick out of them (and I'm sure they look forward to seeing what you guys will come up with each year!). This is my favorite time of year to visit your blog! :) So good! Creative and always done so professionally. Can't wait to see what the house decor will look like. This is such a fun and unique Halloween idea! I am obsessed with/terrified of sharks and refuse to go in the ocean but feel like shark week should be a national holiday so I can't wait to see what you do! I know it is gonna be awesome and I love the details of the invite. I am seriously hoping this means Agatha will be dressed as a baby shark. Too cute! i LOVE all of your halloween stuff (i look forward to it every single year!). I'm curious, what do y'all do at your parties? games? Where did you find the little people to put in their mouths? I'm doing a "terrors of the deep" halloween party this year and I could use those tiny people for some decorations!